Just in case the Yuzheng 310‘s scaring-away of three “warships” from an unnamed country wasn’t enough to convince the Chinese reading public of the heroism of the Fisheries Administration, we now have a juicy follow-up: ‘Guangxi fishing boats surrounded by foreign gunboats, rescued by Fisheries Administration vessel, one-versus-five‘. Cheng appears to be travelling with the Fisheries Administration, as Zhang Fan did when he “re-planted” the Chinese flag on Scarborough Shoal, and has done some more extended pieces purportedly giving expression to the fisherfolks’ voices. 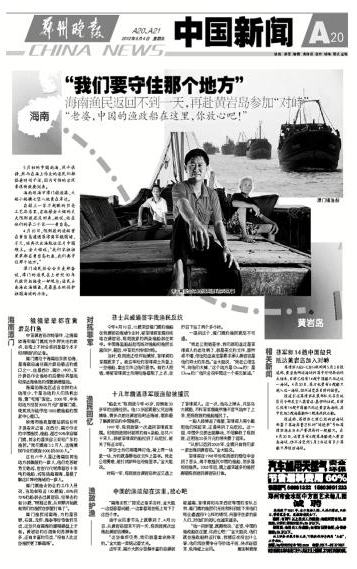 One recent feature piece was framed to be critical of the government’s current position, specifically the idea of China not firing the first shot, being titled, ‘Fisherfolk’s grief: we don’t fire the first shot, countries occupying the islands have fired countless shots‘. In this latest incident, it was Yuzheng 302‘s turn for conscientious bravery. A Guangxi fishing boat with nine crew on board had been encircled and brought under the control of five gunboats from another country 另一国. It was being towed behind one of the gunboats towards a port in that country. After nine hours of pursuit, and a one-versus-five battle of wits and courage, Yuzheng 302 actually saved the fishing boat. It was the Fisheries Administration boats’ actions to protect fisherfolk that prevented the two incidents from becoming bigger diplomatic problems, avoiding adding new chaos to the already-tense South Sea situation. That last line suggests that the recent props for the Fishing Administration’s South Sea forces may be aimed more at the ruling party than the public. 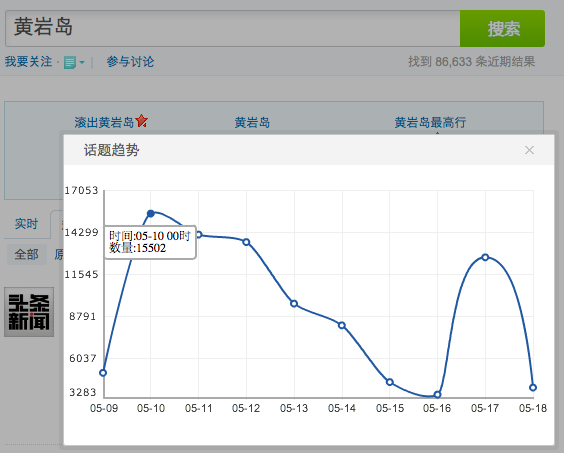 Even if the Ministry of Agriculture and FLEC are jumping up and down, and using media like the Huanqiu Shibao to say, “Hey, look what we’re doing in the South China Sea,” they’re more likely saying this to the allocators of funding than the actual reading public at large. 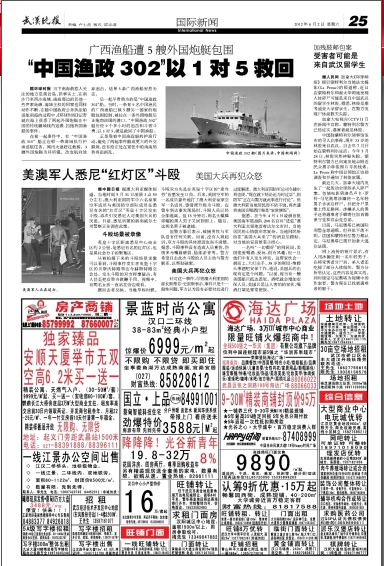 The story appeared in the print edition of the Huanqiu Shibao on June 1, which is behind a paywall, but other newspapers such as the Hanyang Evening News (Wuhan) picked it up on June 2, running it complete with a photo of the heroic ship. All the five major portals have run the story, and though i can’t confirm whether it was in the lead headlines, the fact that they have all generated large comment threads suggests that it was. 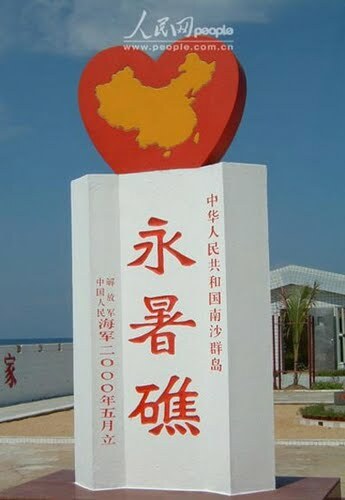 Where the Chinese Navy was, given that the unnamed other country had sent in naval vessels. Why the offending country wasn’t named. No-one seemed to notice Cheng Gang’s specification that the two incidents had been committed by different country. The first comment above clearly assumes the perpetrator to have been Vietnam. Which country could it be this time? Malaysia? Neither of the confrontations appear to have been picked up by the foreign press, and nor have any of the English-language Chinese media (e.g. 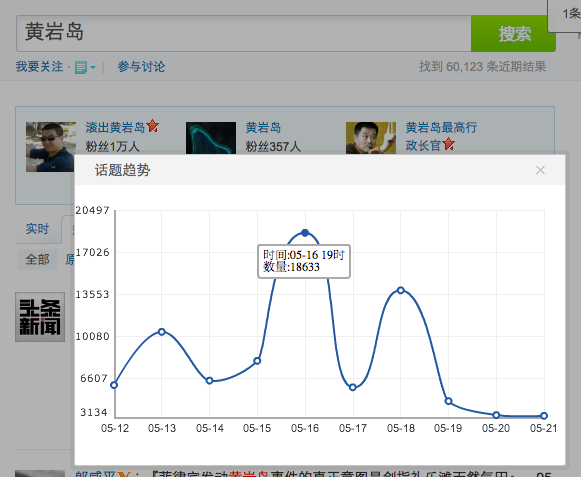 Global Times, China Dailyand the People’s Daily online) have published it. The Foreign Ministry doesn’t seem to have answered any questions on the topic. South Sea Special Correspondent Cheng Gang himself has talked here on the professionalization of journalism in China. But i can’t help but wonder: being embedded with the the Fisheries Department, is he under some kind of spell — like Western journalists embedded with troops in Iraq? Are these tales even true? It was as though they were playing tag-team† in a WWF wrestling show. Just as the China-Philippines tensions started to diminish, who should pop up to disturb China’s peaceful claims? Why, “a certain neighbouring country”, of course. When Philippines President Benigno Aquino III welcomed, and indeed matched, the PRC’s yearly South China Sea fishing ban, Vietnam’s Foreign Ministr labelled it “invalid”. 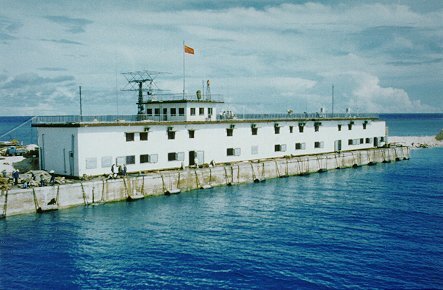 On May 24 the Vietnamese held another press conference at which spokesman Luong Thanh Nghi said that China had detained two Vietnamese fishing boats in the Paracel Islands on May 16 (for some reason this VietnamNet report says the incident occurred in the Spratlys), and held the 14 crew until May 21. As soon as China officially advised Vietnam about the incident on May 21, according to spokesman Luong, the Vietnamese side lodged a strong diplomatic protest against the “severe violation of the sovereignty, sovereign rights and jurisdictions of Viet Nam”. 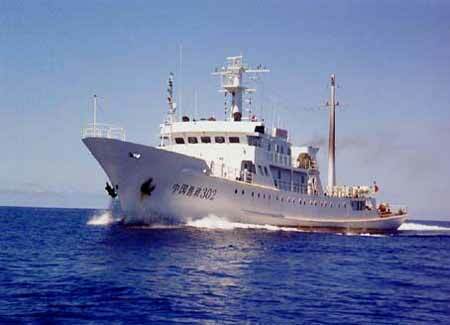 Vo Minh Quan, 42, the captain of QNg 50003TS boat, said the fishermen went to sea on May 2. 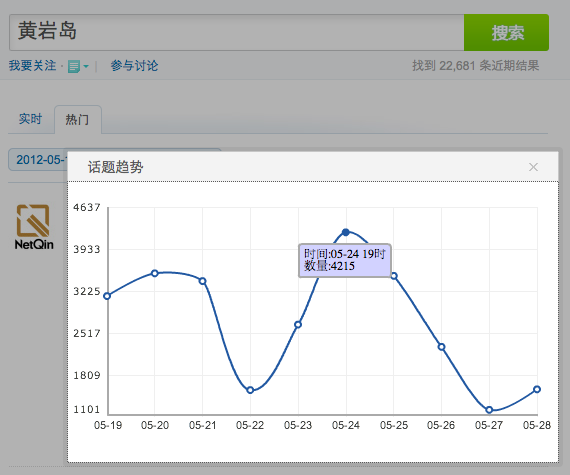 Fourteen days later, at 9 am on May 16, a Chinese ship coded 306 suddenly appeared and seized the boat and the crew. 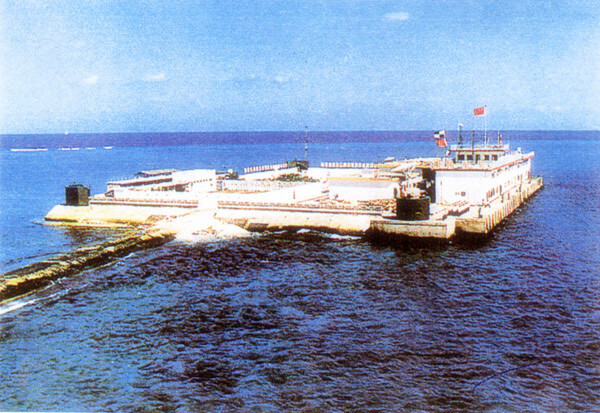 The foreign ship later captured the QNg 55003TS boat piloted by captain Tran The Anh and then escorted the two boats with all their crewmembers to Phu Lam [永兴, Woody] island for detention. The Chinese authorities confiscated all fishing tools, maritime equipment, 2,000 liters of oil, five diving cylinders, and a large amount of sea products. Total value of the seized items of both fishing boats is estimated at VND900 million (US$43,200). Quan said. 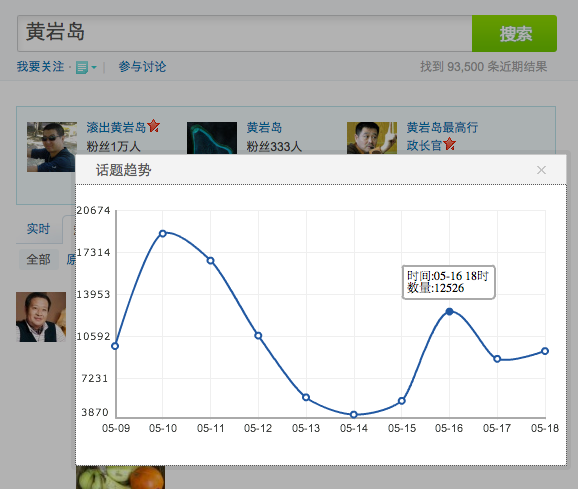 At 12 am on May 21, the Chinese captors released all fishermen and the QNg 50003TS but kept the other boat in detention. 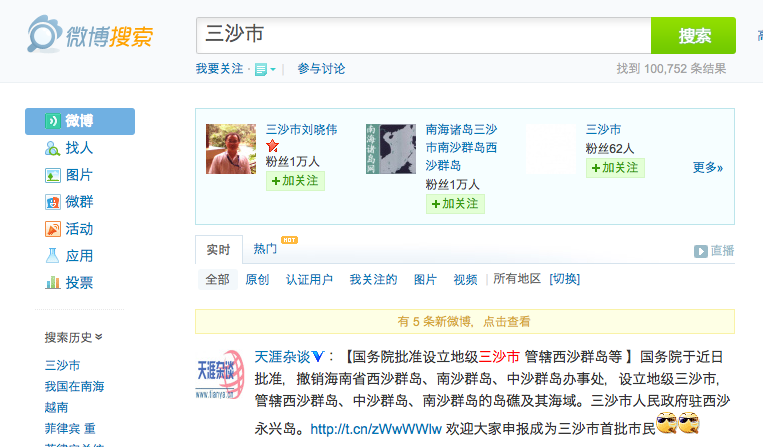 ….but i have failed to find anything at all in the Chinese media about the incident. From Huanqiu Shibao‘s specially-dispatched journalist in the South China Sea: On May 18, China’s Yuzheng 310 vessel successfully deterred three gunboats from a certain country from pursuing and harassing 追袭 five Chinese fishing boats, protecting more than 100 Chinese fisherfolk from financial loss and personal harm.